Timmerans claim to produce Belgium's finest lambic beer, which seems like a big call as Belgium produces I would say 95% of the world's lambic beers. The brewery has been around since 1781 so it has to be doing something right. This brewery also brew many other fruit lambics but this is the original. 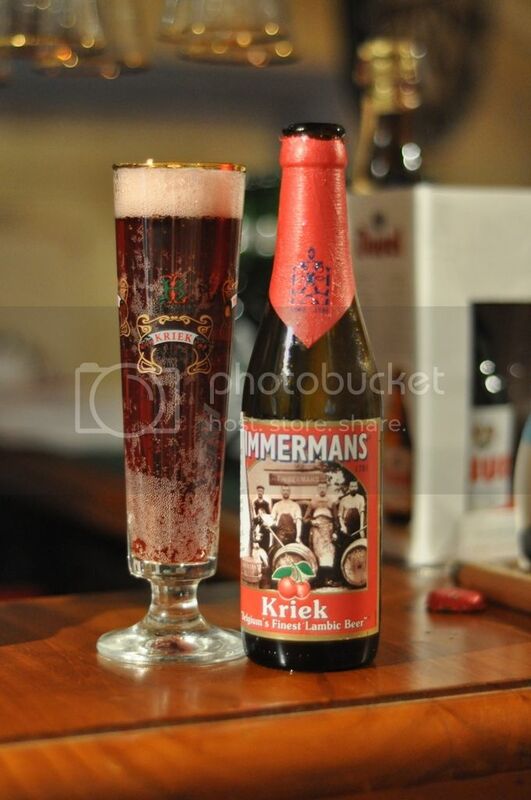 Kriek (cherry) was the first fruit beer flavour to be regularly produced. Timmerman's edition is an authentic lambic beer, produced by naturally occuring yeasts, which whole cherries were steeped in during maturation. This beer is renowned for it's remarkable red colour, so I'm quite keen to pour this and take a look. Wow! The colour really is red! It reminds me of the liquid panadol you get as a kid, except it looks quite fizzy. There are lots of bubbles that both stick to the glass and rise to the iconic pink head. The head seems bubbly and dies to a thick layer reasonably quickly, however the remaining head manages to lace the glass surprisingly well. The beer looks great and the red it truly amazing, the photo doesn't do it justice. The beer smells slightly sweet with cherries (obviously!) being the predominant odour. There is a sour note to this beer and it seems to have a tart acidic nature, sort of like a sherry. I can't smell alot in the way of malts, which isn't necessarily a bad thing in the case of this beer. I'm really struggling for descriptive words with this beer, all I can think is that it smells like the red starbursts. Overall I have to say this beer is sweeter than what I was expecting. There is a huge cherry flavour upfront before a slightly sour flavour kicks in. The beer is very crisp and light, and is not ruined from being overly sweet or sour like many other beers in the style. Again it reminds me of red starbursts, which I would not have thought would lead to a good beer taste but strangely it does. I liked this beer quite alot, it has all the elements that a fruit beer should; excellent fruit characteristics, very refreshing and of course it's rather cheap. I would recommend this more than the Lindemans Apple as the sour elements to this beer make it a more rounded beer and of course because this is the more traditional style. This one would be good for summer, and actually reasonably sessionable.